OSWEGO, NY – The Oswego City firefighters will be holding its third annual golf tournament to benefit the Muscular Dystrophy Association. Tournament co-chair Brooks Hourigan, co-chair Buddy Wilson and Jim Dowd Sr. VP Chief Financial Officer of Pathfinder Bank. The tournament will be held at the Tamarack Golf Club on Sept. 12 with a shotgun start at 9 a.m. The format will be Captain and Crew and the cost is $300 per team of four. The entry fee includes 18 holes, cart, skins game, mulligan and string, hot dog at turn, chicken dinner and prizes. We will also have longest drive, closest to the pin, 50/50 raffle, auctions, putting and chipping contest and a $10,000 Hole in One prize. Tournament co-chair Buddy Wilson, Brian Cummings branch manager Oswego County Federal Credit Union, co-chair Brooks Hourigan. Last yearâ€™s event raised more than $7,000 with 88 golfers competing. 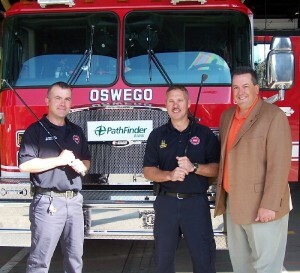 The Oswego City Firefighters and the MDA appreciate the support of all the sponsors, golfers and volunteers who make this tournament a success and especially our major corporate sponsors Pathfinder Bank and new this year Oswego County Federal Credit Union. We hope you join us for a fun day of golf and help us keep committed to a cure. For more information, call Brooks Hourigan at 529-2524 or Buddy Wilson at 529-4529.